Ross Baum and I had a BLAST at the 30th Annual NAMT Festival of New Musicals! Over 700 people traveled from all over the country and across the Atlantic to see the 8 shows featured, and GUN & POWDER received nothing but roaring applause and phenomenal enthusiasm! We’re so looking forward to the next steps for our show! The NAMT presentation of GUN & POWDER was directed by Warren Adams, and featured the talents of 10 breathtaking performers, including HAMILTON’s Solea Pfeiffer and Liisi LaFontaine of DREAMGIRLS (pictured above). The Inaugural Cycle of the Geffen Writers' Room!!! 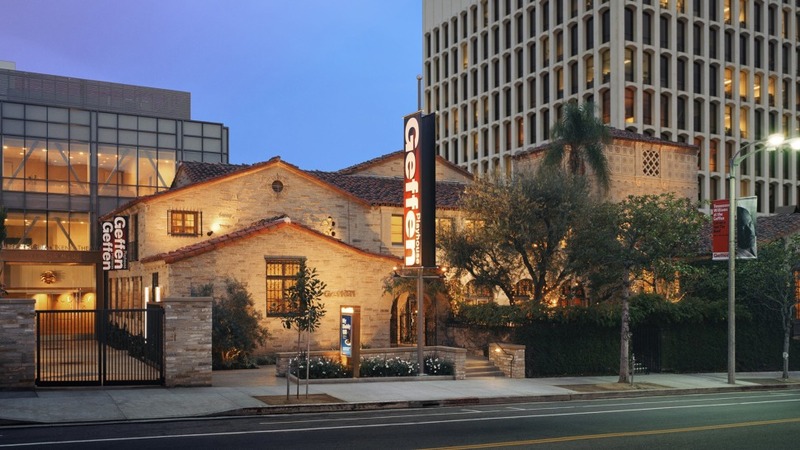 It thrills me to announce that I am one of six playwrights chosen for the inaugural cycle of the Geffen Writers' Room at the Geffen Playhouse in Los Angeles! Over the course of a year, we will meet once a month to develop new plays, which the Geffen will later present as staged readings. Read the article on Playbill! From July 10th-July 23rd, Gun & Powder was featured in the NEXT Festival at Theatre Latté Da in Minneapolis, Minnesota. Directed by Nicole Watson, Angelica and Ross wrote a few new songs and presented two public presentations of the draft. Learn to Speak Doll Soars at Peppercorn! Learn to Speak Doll opened on July 7th at Peppercorn Theatre in Winston-Salem, North Carolina with a cast of four young performers and one adult performer. Featuring a stringed trio of musicians, original choreography and stunning projection design, Learn to Speak Doll premiered with 15 performances. Check out the page for more details. It was an afternoon to remember. Ross and I were floored by the overwhelming honor of being recognized at the Ceremonial with the Academy of Arts and Letters for the Richard Rodgers Award. In the company of legendary writers, composers and artists, we were thrilled to be in that number. It's official, Gun & Powder is a Winner of the prestigious Richard Rodgers Award!!! Joining in the legacy of such acclaimed musicals as Rent, Violet, Grey Gardens and Natasha, Pierre & the Great Comet of 1812, Ross and Angelica have been recognized by the American Academy of Arts and Letters and awarded with funds towards a workshop production at a major theatre in New York City. Stay tuned for production details!!! 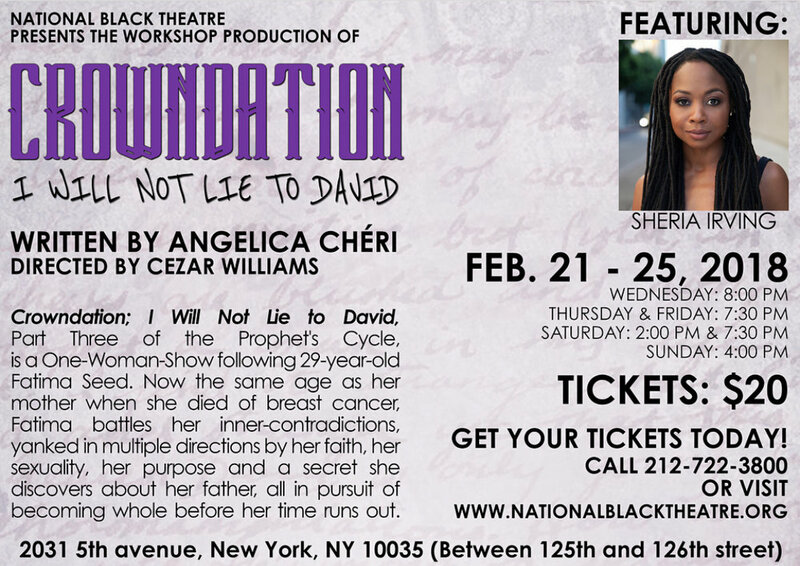 In a flash, we closed the workshop production of Crowndation; I Will Not Lie to David at the National Black Theatre. It was a tremendous journey, and yet it's only the beginning! 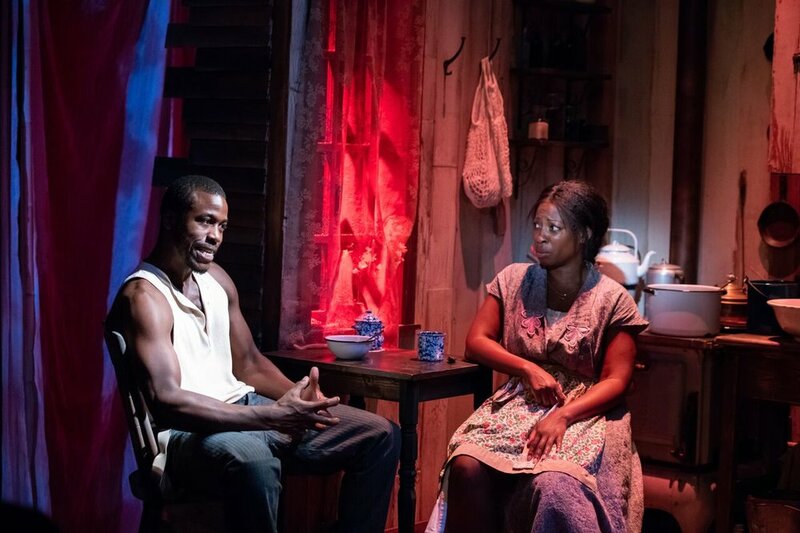 Thanks to my team, pictured LTR above: Jonathan McCrory (Producing Director), Belynda Hardin (Stage Manager), Me!, Sheria Irving (FATIMA), Cezar Williams (Director) and Alan C Edwards (lighting/set design). Not pictured: Ross Baum (composer), Caroline Eng (sound designer), Gregory B Caldwell (sound engineer). We're about to open!!! Click here for tickets! The Lincoln Center Concert was a Hit!!!! This Monday seven songs from Ross Baum and my show Gun & Powder were performed in a SOLD OUT concert of Ross' work at Lincoln Center. And we premiered our amazing new stand-alone song "Winter", performed by the incredible Hannah Corneau (Hedwig National Tour). 'Winter' by Ross Baum and Angelica Chéri, performed by Hannah Corneau. Mentioned in American Theatre Magazine! American Theatre Magazine highlights Jackie Alexander and The Sting of White Roses! One week away from the 2017 National Black Theatre Festival, American Theatre Magazine highlights Jackie Alexander, new Artistic Director of North Carolina Black Repertory Company and the new works he's bringing to the table. Angelica speaks about her experience working with Jackie on The Sting of White Roses and the outreach initiative the play inspired. Read the article here!